There seems to be no uniformity of purpose on futuristic calculations bordering on zones and presidential slots following what can be seen as clash of direction on 2023 presidential permutations even though 2019 is yet to come. 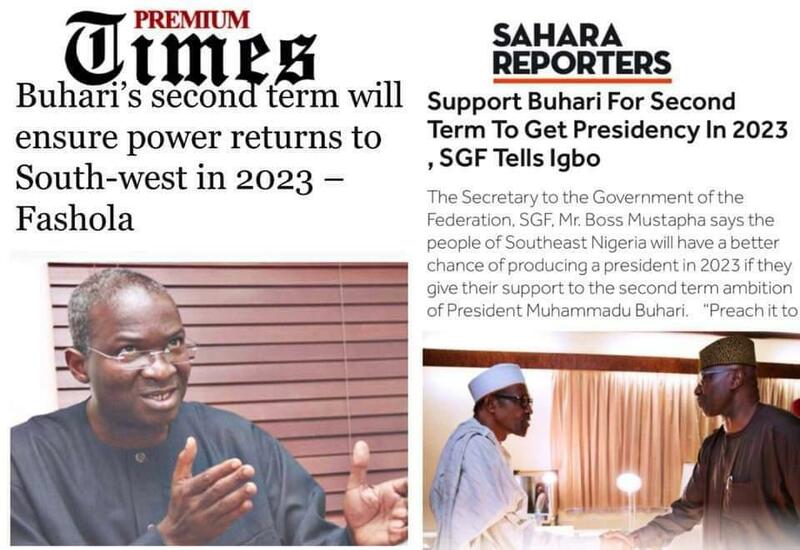 Whereas a number of top government officials in the present administration had over the years been dangling shift of presidency to South East if president Muhammadu Buhari goes second term, only weekend, the Minister of Power, Works and Housing, Babatunde Fashola told Nigerians at a South West Town Hall meeting that it is better to vote in Buhari for second term so that the zone will produce the president come 2023. No doubt, the card is very clear. Possibly, there may have been a plan to front the current Vice President, Yemi Osinbajo come 2023 not minding any recourse to balance of power amongst the major regions of the country. However, analysts say the above scenario can only play out if President Buhari wins in 2019. On the other hand, if Buhari loses to Atiku Abubakar, the PDP presidential hopeful who has a South Easterner as running mate, another line of permutation for South East will emerge. In line with the latest outburst by the Minister which the federal government has not denied, analysts say the comment may become a strong factor that will shape the pattern of voting come 2019. President Emeritus of Aka Ikenga, Chief Goddy Uwazuruike in his reaction averred that “It’s possible for South West to get the presidential ticket of APC in 2023. This is because APC is an amalgamation of North West and South West political lords. All the other zones are joiners. For record purposes, the APC was the brainchild of Dr. Ogbonnaya Onu, but at the crucial meeting where the substratum of the party was decided, he was excluded. South East political leaders in APC are mere hangers-on in the corridors of power. In his submission, former Minister of Information, Chief Tony Momoh, is of the view that whoever ever wants the Presidency must work hard for that to come to pass. He recalled that APC and President Buhari didn’t get up to 200, 000 votes out of the estimated nine million votes cast in the South East in 2015 because it calculated that PDP will win, while the South West supported the president. Continuing, he claimed that “To give the Presidency to any region depends on the support of the zone because power is not, and cannot be given on a platter of gold. Nobody is going to tell the Igbo to vote for APC because in the next general election, three political parties will be prominent in the South East- the APC, PDP and APGA. If the Igbo people decide to support PDP and APGA and the ruling party eventually retains power till 2023, it would be unthinkable to believe that the Presidency would be conceded to the Igbo at the expense of the Yoruba that gave their support.“For now, even if they support the former vice president (Atiku Abubakar) in next year’s election, that would still not guarantee the region getting the presidency in 2023. The onus is on them to decide whatever they want in the coming presidential election,” he said.